Stetson University researcher addresses growing threat to coastal communities. 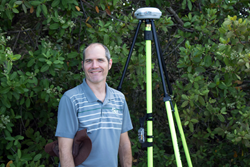 Evans uses GPS to measure, map and assess the vulnerability of areas to sea-level rise. Photo by Rhiannon Boyer. “We believe that the final report provides a base amount of information and data that will assist the continuing efforts of city officials to reduce flood risks for the benefit of current and future residents," said Evans. Increased flooding caused by sea-level rise is a growing threat to coastal communities in the United States. In response to the issue, Jason M. Evans, Ph.D., assistant professor of environmental science and studies at Stetson University is working with Sea Grant programs and several communities in the southeast including St. Marys, Georgia, and Satellite Beach, Florida, to discover ways to adapt to sea-level rise. Evans will present research findings and address community concerns at several events throughout Florida and Georgia in the coming weeks. Evans’ research focuses on discovering vulnerabilities of public facilities such as stormwater drainage systems, fire stations and wastewater treatment plants, and finding ways to help communities adapt to sea-level rise and become more resilient to coastal hazards. His research is in collaboration with Sea Grant programs in Florida, Georgia and North Carolina. Planning Workshop: Sea-Level Rise and Flooding, St. Petersburg, Fla.
On May 11, Evans will participate in this Florida Sea Grant workshop geared towards local government managers, attorneys, engineers, floodplain managers and planners focusing on the legal and policy challenges confronted by local governments as they face increased flooding and sea-level rise. The workshop will provide a brief overview of sea-level rise and flooding projections, showcase regional efforts to evaluate vulnerability and reduce flood risk, discuss state law requiring planning for flood and sea-level rise, and review the changing landscape of flood insurance. Florida Coastal Management Program Meeting, St. Augustine, Fla.
At the annual meeting on May 16 Evans will discuss the City of Satellite Beach Community Resilience Campaign. This program builds on past research to measure, map and assess areas of vulnerability to sea-level rise. The goal of the Florida Coastal Management Program is to coordinate local, state and federal agency activities using existing laws to ensure that Florida’s coast is as valuable to future generations as it is today. This event brings together stakeholders and partners to discuss local coastal management issues. On May 15, Evans and many of the authors and researchers that were part of the St. Marys Flood Resiliency Project will present their findings from a three-year study on the rising risks of flooding to the City of St. Marys Mayor and Council. A collaboration between St. Marys, Georgia Sea Grant, Stetson University and North Carolina Sea Grant, the project began with a series of stakeholder interviews, town hall public meetings and facilitated discussion sessions to form the heart of an innovative Vulnerability, Consequences and Adaptation Planning Scenarios (VCAPS) structural modeling approach. Results from the VCAPS process were then used to inform a series of custom geo-spatial vulnerability assessments that analyzed current and future flood risks to property and infrastructure under different sea-level rise scenarios. The VCAPS process and geo-spatial assessments both indicated the high vulnerability of historic downtown St. Marys, on the banks of the St. Marys River estuary, to current and future coastal flooding. While the most serious and acute flood risks in St. Marys are associated with storm surges from tropical cyclones, there are increasing concerns about more chronic flood events associated with intense rain storms that occur at or near high tide. Detailed analysis of the city’s infrastructure indicates that the configuration of the stormwater drainage system, which was built decades ago without any knowledge of long-term sea-level rise, is a major source of flood vulnerability. This vulnerability is expected to worsen as a direct function of sea-level rise unless the local stormwater infrastructure system is upgraded over time. Although there are substantial challenges, much of St. Marys’ flood vulnerability likely can be managed with appropriate planning and investments over the next several decades. A complementary objective of this project was for Georgia Sea Grant personnel to assist the City of St. Marys with its application to join the Federal Emergency Management Agency’s (FEMA) Community Rating System (CRS). Last May, St. Marys successfully joined CRS with a Class 7 score. This translates into a 15 percent reduction in National Flood Insurance Program premiums for properties within the Special Flood Hazard Area. In the first year following this successful CRS application, it is estimated that St. Marys residents saved over $87,000 on their flood insurance premiums. Founded in 1883, Stetson University is the oldest private university in Central Florida, providing a transforming education in the liberal arts tradition. Stetson stresses academic excellence and community-engaged learning, and consistently earns high marks in national rankings. Stetson encourages its students to go beyond success to significance in their lives, the lives of others and their communities. Stay connected with Stetson on social media.